Action Typist: A-to-Z of Adventure: "F" Is for "Flint"
Derek Flint, the Original Man of Mystery, is getting his own comic. Derek Flint, inventor, ballet instructor, editor and contributor to the revised Kama Sutra, transcendentalist and translator of an ancient Mayan cookbook, seeker of the third eye and freelance spy, is the one M.A.C.E. (Mandated Actions for Covert Enforcement) calls on to tackle their most perilous assignments. From crazed Nazi scientists hatching dastardly plans, sultry Russian spies with killer bodies and kung fu grips, super strength cyborg assassins, to fiendish henchmen and quixotic masterminds, these are examples of adversaries mystery writer Gary Phillips (Operator 5 and Decimator Smith) will throw at the cool, collected Mr. Flint. 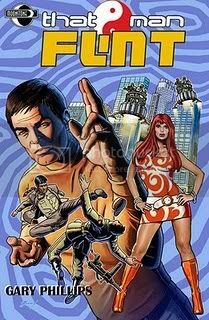 With his gadgets and skills, aided by his quartet of brainy glamour gals, That Man Flint is a retro revisionist series capturing the fun, feel and excitement of halcyon espionage fare such as The Man from U.N.C.L.E., Bond in Goldfinger,and Steranko’s Nick Fury for today’s audience . . . I couldn't get your video to play, but I enjoyed the nostalgic photos and post.